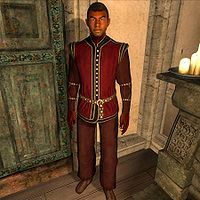 Gogan is a Redguard warrior living in the western corner of Anvil with Maelona. Recently, while visiting The Flowing Bowl, Gogan was seduced by Faustina Cartia and lured to a remote cabin where he was robbed blind by a whole gang of armed Sirens. They took all of his clothes and, more importantly, Maelona's family heirloom. During the related quest you are asked to retrieve the heirloom and save what is left of Gogan's reputation and marriage. After the embarrassing incident, Gogan tries to keep a low profile. After waking up at 6am, he takes a three-hour breakfast with his wife and then strolls around the house for most of the day. At 8pm, provided the weather is clear, he takes an evening walk in the streets of Anvil before returning home for his bedtime at midnight. He will not speak much, and on the subject of Anvil he will just say: "Sorry. I'm new in town. Don't know a soul." He wears a burgundy linen shirt, matching linens, and thick cowhide shoes. He carries around a copy of The Eastern Provinces, his house key, a cheese wedge, and a small amount of gold. 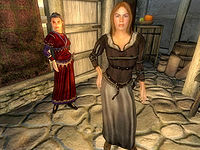 "...the most fetching Nord woman you've ever seen walked in with an equally attractive Imperial woman following." When you arrive in Anvil for the first time, Gogan will be the laughing stock among the gossiping townsfolk: "You hear about Gogan? A gang of thieves is running a scam in town, and he fell for it! Hahaha... what an idiot!" When asked about the gang, they will say: "If you want to help us do something about it, go talk to Gogan and Maelona. Let's just say Gogan is intimately involved and leave it at that." When you approach the embarrassed Redguard, he will only utter "Eh?" and be on his way. If you talk to him, even before the quest is initiated, he will point you towards his wife for information: "Talk to Maelona. She runs the council. Judge, jury and executioner." and "Talk to her, she seems to have all the answers." Indeed, Maelona will express her frustration with Gogan's little stunt: "Believe me, he'll need all the help he can get to worm his way out of this one. To think he'd fall for the gang's scheme... agh! I could kill him!" and "The women in the gang use their wiles to lure men out to some remote location and rob them blind. It's been going on for some time now. The city guard hasn't done very much about it, because frankly, the men who are robbed are so embarrassed, they don't want to report it. Take for example that good-for-nothing husband of mine, Gogan. He cared more about their charms than my own." She will even add "Good-for-nothing louse of a husband. He's lucky I still love him." She will then tell the tale: "When Gogan was, uh... with the women, they took something quite valuable from him. No... it's not what you're thinking. He was carrying a precious family heirloom with him when he was lured out to their lair. It was a small ring given to him on our wedding day. The ring belonged to my mother, and has been in the family for generations. I'm willing to give you all the money I have to get it back. 100 gold. Can you help us?" and finally point you towards Gogan: "All I can tell you is that the best place to start is at The Flowing Bowl. It's a tavern located outside the city walls near the waterfront. Gogan may be able to give you more information beyond that." She will also bitterly say: "Nothing much more I can help with. I'm afraid you'll have to ask Gogan, my lout of a husband, if you need to know anything else. I'm sure he can provide very highly detailed descriptions of the women." When you revisit Gogan he will say: "I see my wife couldn't keep her big mouth shut. Yes, it's true. I lost the family ring to those sirens. I'm ashamed about the whole incident, but not ashamed enough to ask for your help. I was sitting in The Flowing Bowl, when the most fetching Nord woman you've ever seen walked in with an equally attractive Imperial woman following. After we exchanged words, I followed them out to a farmhouse. Inside, they asked me to remove my clothes and items. Well... I did... and then suddenly they brandished weapons and robbed me. They sent me away with barely a stitch of clothing! Harlots! Just please, help me get that ring back. I want to save what's left of my marriage." He will finish the conversation with a pathetic: "I'm merely a man. How could I resist? What a mess I've gotten myself into." When approached again, he will say: "Just hurry back with that ring... please." After the promised 'date' with Signy Home-Wrecker and Faustina Cartia, Gogan will at first say: "I heard you made contact with the gang. Beauties, aren't they?" He will then be puzzled: "A farmhouse? Hmmm, last time it was a cabin. They must be moving around. Just be cautious." And he will add: "They met me at eleven as well. And believe me, I arrived right on time." Later on, inside the love nest that is Gweden Farm, Faustina will get furious when you demand Gogan's ring back: "Damn, I knew it! You're working for the city guard aren't you? I didn't think they would be stupid enough to send someone alone, but so be it. I should have known after I fenced that stupid ring and discovered it was a fake. Worthless! All part of the guards' plan I suppose." She will then call upon Signy and the third member of the Gang, Tsarrina, and they will all fight you to the death. After the bloodbath, Gogan and Maelona will show up wearing their Anvil City Watch uniforms, confirming Faustina's suspicions; Gogan's armor includes the standard Anvil cuirass, chainmail boots, gauntlets, greaves and a guard helmet as well as a shield and a steel longsword. While Maelona will do most of the explanation, telling you about the undercover work she and Gogan does, Gogan will be more silent and will only add: "Got a lot to do here. We can talk later in Anvil." and "Little busy right now. Got your mess to clean up." Later on in Anvil, meeting Gogan will make him say: "They still aren't letting me live this down." He will, however, be quite happy when asked about the gang: "Everyone's making fun of me because I fell for the siren's charms. Well, now I have the last laugh!" He will still want his screw-up kept as a secret though: "Do me a favor, don't say anything to the other guards that I fell for it, ok? Thanks." If you managed to fail the quest by killing the Sirens inside the Flowing Bowl, both Gogan and Maelona will be furious on your way of handling the delicate matter. When Gogan sees you he will be quite disappointed and say: "All that work gone to waste." He will then warn you about Maelona: "I can't believe you did that. Maelona is furious." There are actually two different versions of Gogan. Before he meets you at Gweden Farm his character is identified as "Gogan" (RefID 0003AF04 , FormID 0003AF03 ), but once he arrives he is identified as "GoganGuard" (RefID 0003B3D6, BaseID 0003B3D3). 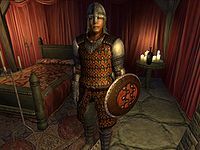 The two versions of Gogan have the same statistics, but have different inventories (as noted above) and belong to different factions: "GoganGuard" does not belong to "Gogan's Family" faction. He was also intended to provide a much longer explanation inside Gweden, but the 'gang' topic can never be chosen: "Sorry we had to fool you like that, but it was the only way to get someone in close enough to stop Faustina's gang. I would have done it myself, but well, ok... I fell for their trick. Thought I'd get lucky, turns out that they don't do anything. They just rob you. Let's keep that between us please... shhhhh."